It’s very much a case of ‘Hail ToThe King’ for Ballyhale Shamrock’s Adrian Mullen. ‘The King’ in question is Henry Shefflin after he masterminded the Kilkenny club’s victory in this year’s All-Ireland hurling club championship. To cap off an excellent campaign for Ballyhale, Mullen was named Player of the Year at the AIB GAA Club Players’ Awards last weekend. Needless to say while the attacker was pleased to have received the award, he did praise others who shared the journey with him, with particular praise for his manager. Speaking at the awards ceremony in Croke Park, he said: "The lads around me are unbelievable. TJ (Reid), Mick and Colin (Fennelly), Joey (Holden), if they were on any team they would go far. It’s really them that drove us on and then you have the younger players coming through like Eoin Cody and Evan Shefflin. 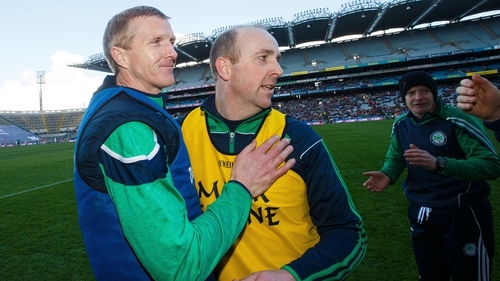 "I used to pretend I was Henry Shefflin and now I’m managed by him. You take it all on board. "Everything Henry says you just do. He's been through it all, so he can't be too far wrong. The majority of the time he is right. To have guidance from him is unreal and he's given me great advice throughout the year." In just over a month’s time, Kilkenny will begin their Leinster championship campaign with a game at home to Dublin and naturally Mullen is hoping to feature for the Black and Amber. "Growing up it’s been an ambition to play for Kilkenny, I’m still trying to work hard to get on the team," he added. "Train hard, work hard, that’s the motto whether it’s club or county."